Whenever I would tell people back in the USA that we were moving to Costa Rica as a family, one of the first questions I would get is where the kids were going to go to school…..once they were able to erase the “Are you crazy?” look from their face. As I mentioned in previous posts (here and here), we debated many countries in which to spend our year abroad, and one of the main reasons we chose the Monteverde area of Costa Rica is because we found an amazing school for the children: Centro de Educacion Creativa or The Cloudforest School as it is known by its USA support organization. We chose Creativa (as it is known locally) because it is a bilingual school, has a higher proportion of Ticos compared to the other international school in the area, and it has a strong environmental component woven into the curriculum. I thought a bilingual school would be less jarring than enrolling the kids in an all-Spanish school. I also thought it would provide a better cultural experience than one of the fancy international schools in Panama or San Jose. 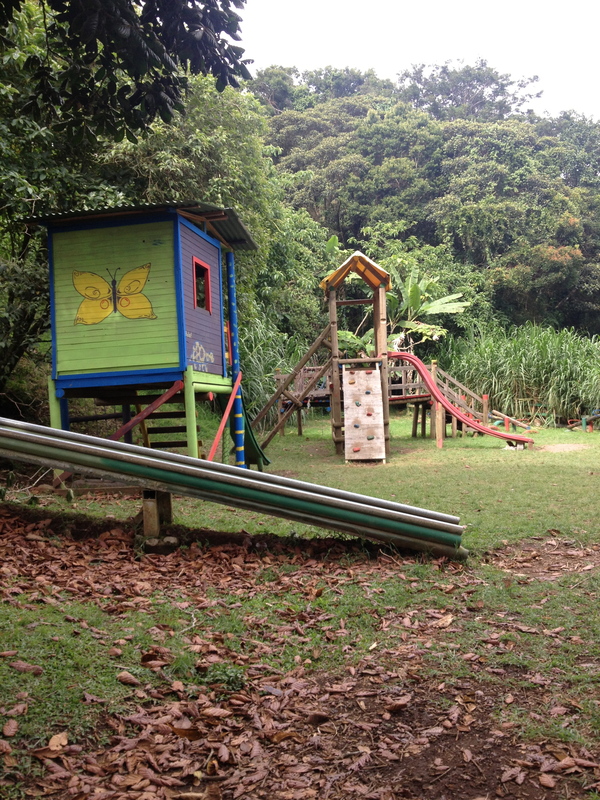 Creativa is located on 100+ acres of beautiful rainforest. The kids are attending summer camp at Creativa this week and they absolutely love it. The first day they came home gushing about how much fun they had. Kara has already made several friends and wants me to set up a “hang out session” (not a play date!) with her Tica friend from Bajo del Tigre. Tristan is slower to make friends, being a 6 year-old boy, but he seems to be enjoying himself. They have seen monkeys and coatamundi on campus. On Tuesday, the school takes the kids on a field trip and I was able to join them this week. 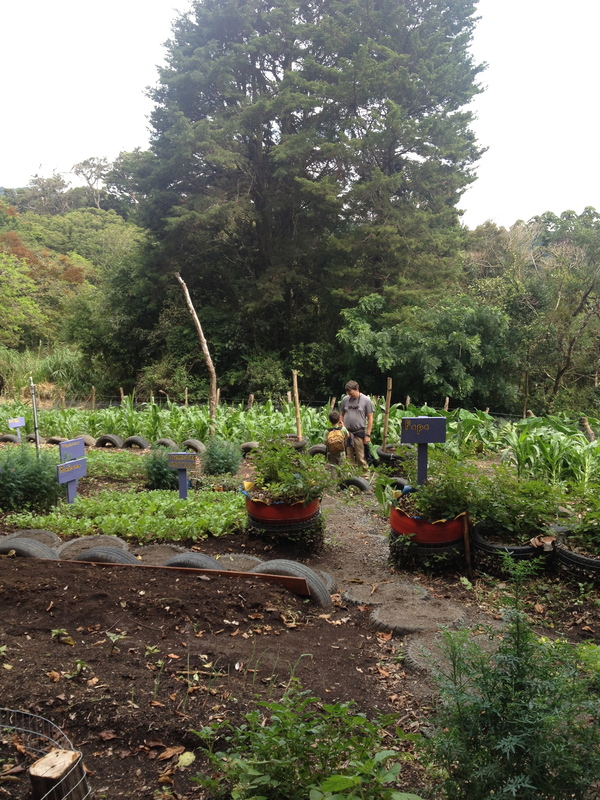 We went to Benito Guindon’s farm. The kids saw goats, pigs, chickens, and ducks with babies. Of course, the highlight of the day was when he brought out a rescued baby sloth that someone had brought him. One of my favorite things about the school so far is the way the older kids interact with the younger ones. The middle school and high school kids are great. They watch out for the little ones and make sure they are safe on the bus and while they were out on the field trip. For example, the older kids make sure the little ones get off at the right bus stop on the return trip. This is a testament to Creativa’s investment of teaching leadership skills to the students. Of course there are teachers supervising, but it is so refreshing to see teenagers take on responsibility. Early in the week, I rode the bus to school with the kids. After seeing how well behaved the Creativa kids are on the bus and the fact there are parents and teachers who ride the bus to school daily, later in the week they rode the bus without me. It is only a 3-4 minute bus ride, but it was still a huge step for me. They had never rode a school bus before when we were in Texas. 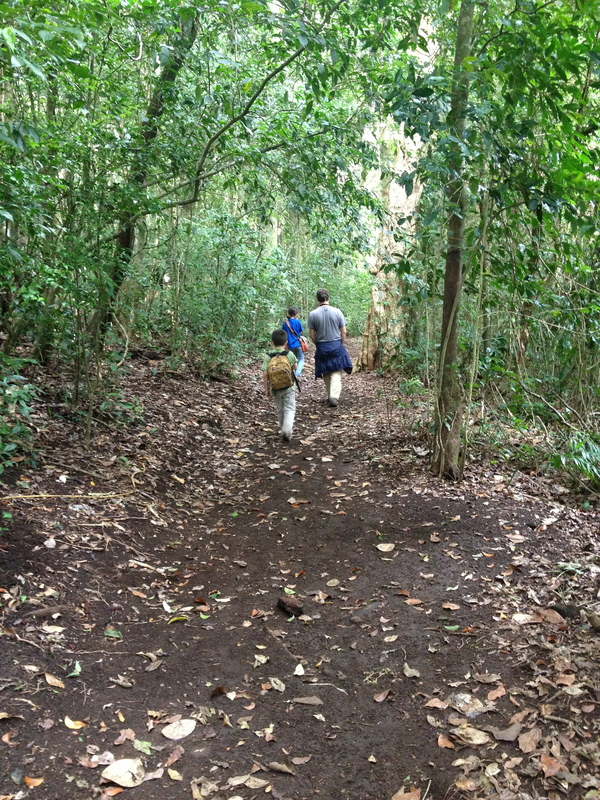 Most of the children at Creativa are Ticos (85%-95% depending on who you ask). This was very important to me because this move is supposed to be an opportunity to experience a different culture, which would be difficult if they were going to an international school with primarily other American children. I love that each child is celebrated at Creativa. When each child’s name was called to get on the bus for the field trip on Tuesday, everyone clapped and cheered. They have a secular “Circle” time in the morning with a moment of reflection. By the end of the first day of camp, all of the teachers knew my children’s name. No words can give justice to the beauty of the Creativa campus. We took a walk through “Angel’s Alley” and their garden yesterday. Here are some pictures. They don’t capture the true beauty of the cloud forest, but it will give you an idea. 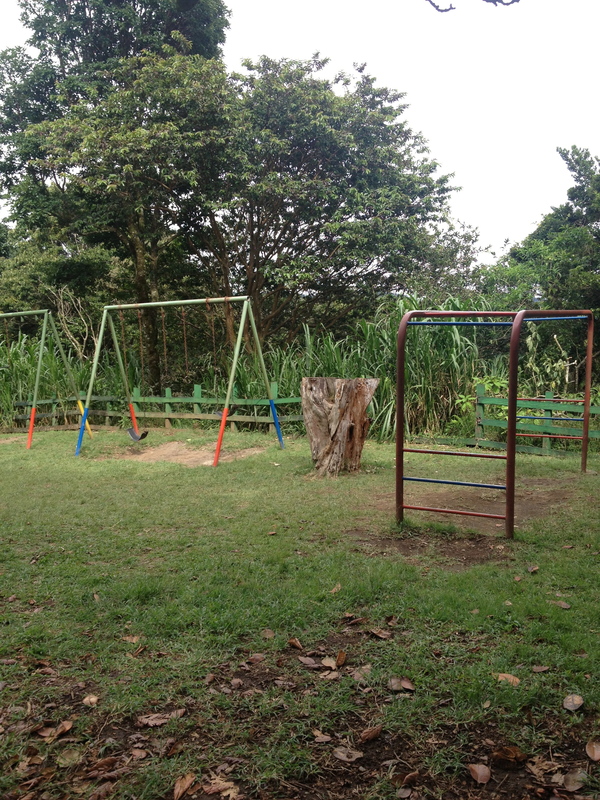 Playground at Creativa. The highlight of the campus for the kids! What about the teachers and staff? I have met several of the teachers this week during camp. I was impressed not only with their credentials, but their enthusiasm and dedication to the children of the school. About half of Creativa’s teachers are from the USA and the other half are from Costa Rica. Tristan will have an American and a Tica teacher when he starts 1st grade this August. Creativa requires at least 2 years experience from their teachers before hiring them. I also love the fact that many of the Tica teachers I have met have their own children at the school. The director, Laura, is kind and approachable. Creativa has summer camps, internships, as well as international students for the regular school year. The camps are available to local kids (whether they are Creativa students or not) and international students (whether they will be attending during the regular school year or not). So if you are flirting with the idea of moving your family to Costa Rica or you are looking for a wonderful international summer experience for your children, check out the Creativa summer program. It is a great way to for your children to learn Spanish and meet kids from other countries. Once the kids start school, I will let you know how that goes. I will be able to go into more detail about the curriculum. 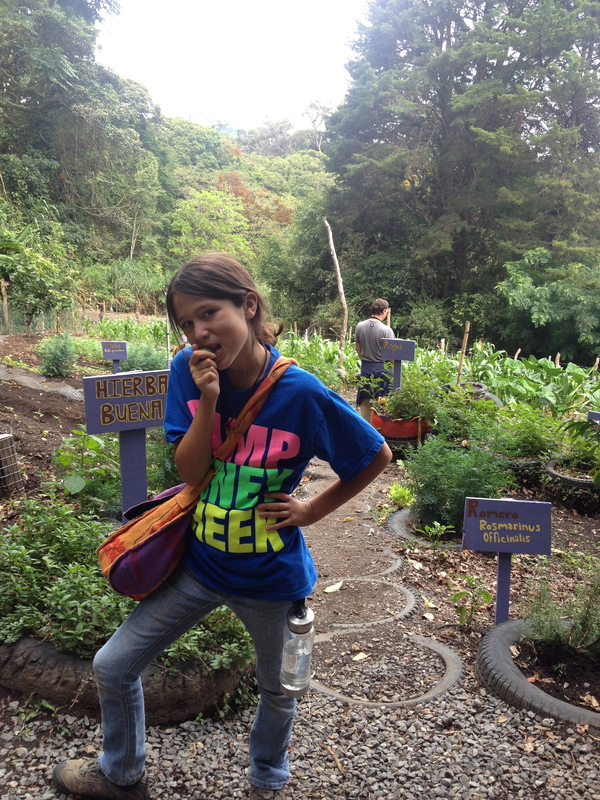 For now, they are enjoying their time at summer camp in the cloud forest. 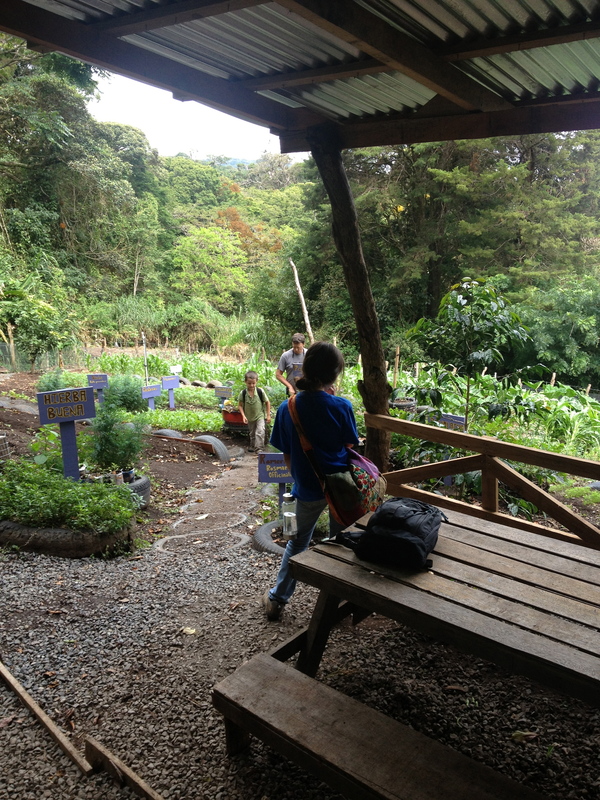 This entry was posted in Centro de Educacion Creativa/Cloudforest School, Education, Schools in Costa Rica and tagged Centro de Educacion Creativa, Cloudforest School, education, expat, International school, kids, Summer camp. Bookmark the permalink.